In the Ladies Division the Mariners defeated the Police 10 - 0, the Mariners got Try’s from Sade James and Amanda Swan. the Renegades would then defeat the Teachers 15 - 0, with Try’s from Melissa Field, Rachael Jenkins, Leah Collis. The Police would go down 32 - 0 to the Renegades who got 2 Try’s from Melissa Field and Rachael Jenkins, while Ashley Godek and Jacque Oliver added the other Try’s Nicky Palle kicked 1 Conversion. The Teachers went down 10 - 0 to the Mariners who got Try’s from Lysmeiri Santana and Deneka Borden. 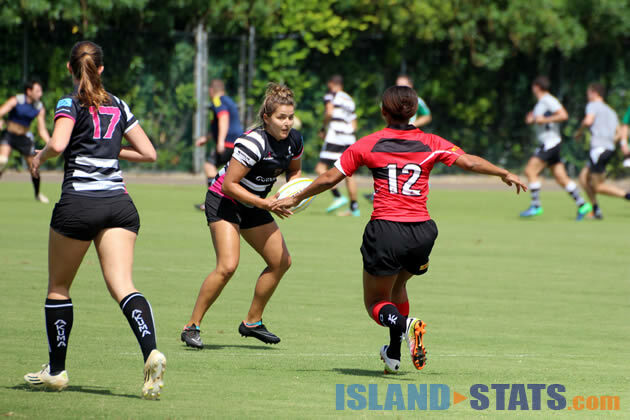 The Mariners went down 12 - 5 to the Renegades, the Renegades got Try’s from Nicki Palle and Suzi Howells with a Conversion off the boot of Leah Collis, while the Mariners got their lone Try from Amanda Swan. The match between the Police and Teachers finished 5 - 5, the Police Try came when Lorna Wright went over, with Teachers getting a Try from Lauren Rothwell.